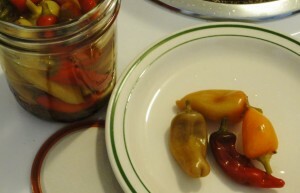 Here is a very easy recipe for making pickled peppers. The peppers may be eaten a day or two after canning, but are better if you wait a month or more. Heat the vinegar, water and salt to 160 degrees F (vinegar is unstable at high heat, so should not be boiled). Simmer without reducing for 5 minutes. Wash the canning jars and lids. 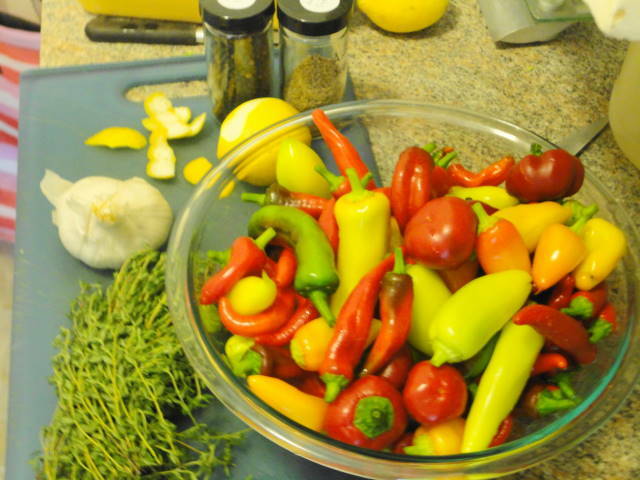 Wash the peppers and then put a t slits in the side of each (if the peppers are very large, they can be cut in half). 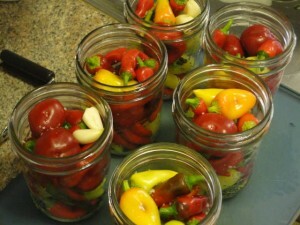 Fill the jars with peppers, packing very tightly, as the peppers will shrink a bit when they are cooked. Add a garlic clove, thyme sprig, peppercorns and anise seeds to each jar. 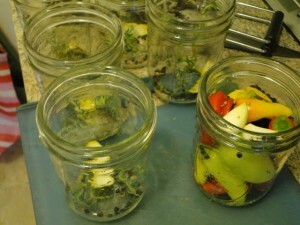 Fill the jars with the hot vinegar solution, leaving 1/2 inch head space. Close the jars tightly with 2 piece canning lids. 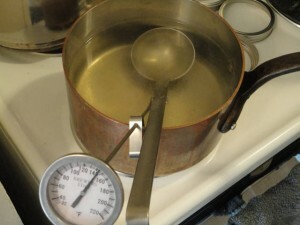 Process the jars in a hot water canner held at between 180 and 185 degrees for 15 minutes. Remove and cool away from drafts. 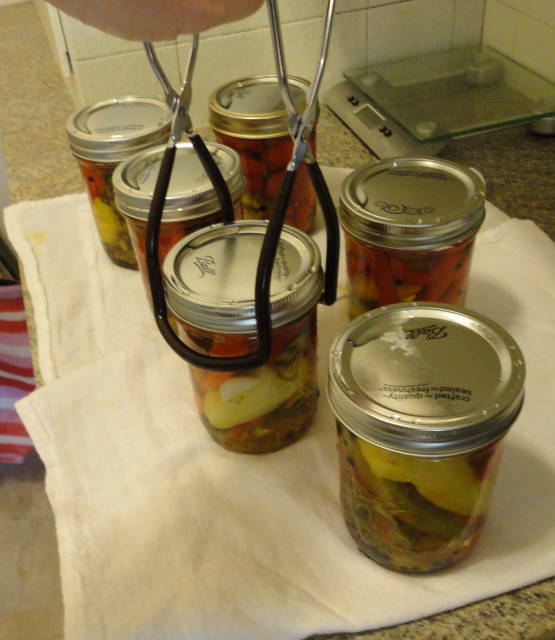 This entry was posted in Pantry and tagged Canning, Pickles and Preserves, Vegetables. Bookmark the permalink. Hey – the current crop of recipes as grand! Especially enjoy the tongue with grated carrots, cumin, etc. Is there a deep log of recipes? Can I find the AMAZING Terrine of Chicken Livers, served daily and, it seems to my wife and I, forever since we started coming in 2001? It delicious smooth texture, singing of butter and cream, the tiny crystals of salt – well you get the picture – I’m Hooked! Help! No seriously – Love you guys – want to start a Le Pichet every where I go!